Until this week, I was unfamiliar with DelicaciesJewelry.com. Yet here we are, on the other side of that discovery, and I find myself most unexpectedly trying real damn hard not to buy a piece of sterling silver elbow pasta. The designer’s Al Dente collection, a collaboration with pasta company Barilla, is pretty damn cute. In addition to satisfying my penchant for weirdo jewelry, they’re also sincerely striking—the elbow noodle necklace most of all. But there’s another good reason to be into the whole “a macaroni necklace but like for grown-ups and not edible” thing—it’s a part of the jeweler’s ongoing partnership with famous chefs and the charities they love. The chef in question for this season is Kristen Kish, the winner of the 10th season of Top Chef and the author of the aptly-titled Kristen Kish Cooking. Like all celebrity chefs with whom Delicacies partners, she picked her favorite piece from their collection—in this case, the elbow necklace—and her favorite charity that feeds the hungry. Her pick: Keep Austin Fed, which aims to do exactly what it says on the tin. 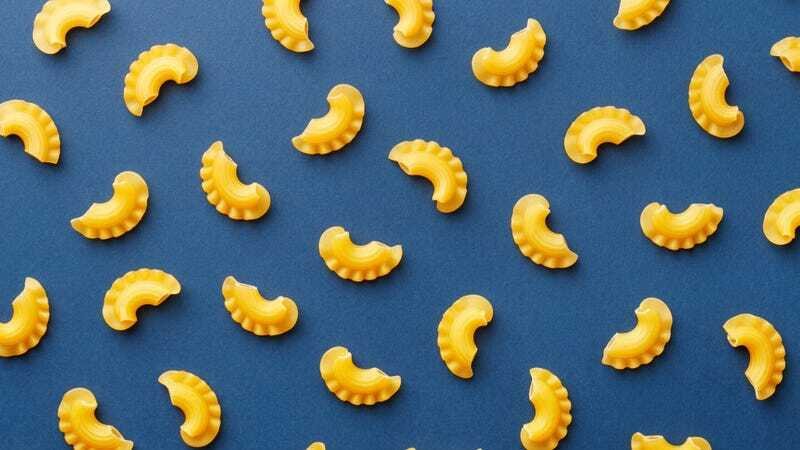 Elbow macaroni is one of those shapes that you see and immediately think of your childhood, and these are the memories that stick with me the most. As a chef and with new dish creation, I pull an immense amount from my childhood memories. To me, the elbow is also a reminder to see the world through the eyes of a child, with innocence, curiosity, acceptance, growth, and resilience. It also comes with a pretty delicious-sounding macaroni and cheese recipe, so there’s that, too—but more importantly, the site estimates that every single necklace purchase will put 20 meals in the hands of people in need. Among the other Delicacies offerings: avocado, egg, chili pepper, artichoke, corn, coffee, the list goes on. It is weird as hell and I am into it. Also, hungry.